The following is a review of G.L. Pease's Telegraph Hill I did on 2/21/06. 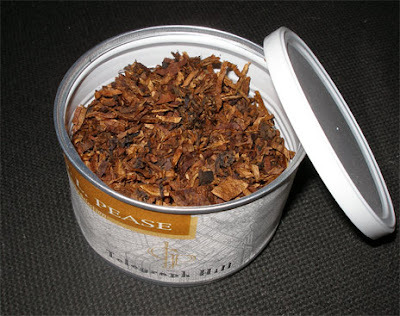 A sturdy foundation of Virginia tobaccos, each chosen for its particular character, is enhanced with fine flakes of perique for a refined smoking experience. Telegraph Hill is rich and flavorful, with a satisfying, lingering finish. Each sip builds upon the last, creating a marvelous edifice of taste and aroma. You won't worry about earthquakes if your pipe is filled with this wonderful blend. Telegraph Hill is a mild VaPer...mild sweet Virginia with a mild spice flowing from the Perique...and they do their job handsomely...not best but darn well. This is a good quality smoke but not my bag of tricks...alone. Vapers find their way into my rotation as a supplement and Tele works well in this regard. As a donut is to coffee, orange slices to cigars etc so too is Tele excellent after two Latakia rich bowls back to back. I absolutely melt smoking this stuff after two bowls of Dunhill's Nightcap. Two Nighties and my eyes are a little heavy and my pallet is caked, this is where Telegraph Hill shines for me. After the nightcaps the Vapers penetrate my pallet with a refreshing flavor. My nightcaping smokes consist no longer of just a primarily rich dark Latakia blend but an added VA or Vapor to boot and Telegraph Hill rings my number in this regard...thank you Pease. And thanks for your fine reviews. How many pipes do you need? Tobacco Cellar? Aging Tobacco? What?